We are an authorized dealer and installer of QuietCool whole-house fans, the only fan that has been approved for the HERO financing program. Anytime it is cooler outside than the inside of a home, the QuietCool whole house fan system will work effectively. 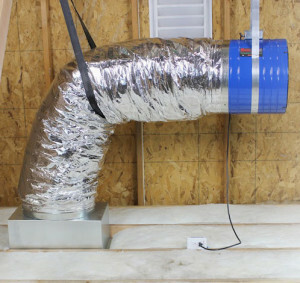 In the summer, this normally happens in the late afternoon to early evening and through to the next morning.When the QuietCool whole house fan is turned on, the fan will pull the cooler outdoor air into your home, through your windows, across your living space, into the attic, and out the attic vents replacing the hot stale air. This helps cool the home and attic by up to 30 degrees, allowing it to stay much cooler the following day. PollenTEC allergen and pollutant blocking screens are a perfect add-on for our whole-house fan installations!